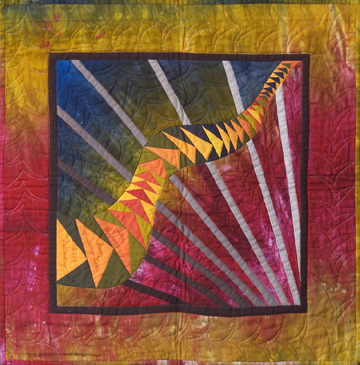 Create your serpentine line of Flying Geese for paper piecing and insert onto the prepared background. Place this onto your dyed background. Fuse black fabric, cut strips and iron down to cover the raw edges. Machine zigzag. An excellent way to have a whole background with no seams.